Six thousand miles, last milestone for the Oceania trip. So here are the facts and figures for these 1000 miles. I could not believe it, “nearly 3000 miles in New Zealand” and a few more in Australia without a puncture. In the end I did not get a puncture but a blow up. 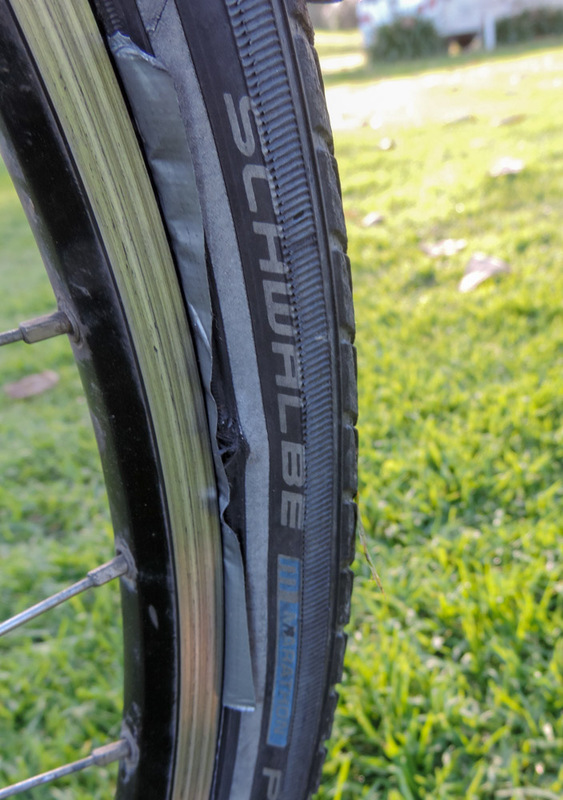 The rear tyre lacerated and eventually the tube gave in. I suspect I had looked at the tyres for a while wondering if they were going to last forever. Perhaps I should have done something more than looking and perhaps a little bit less blowing. I have now passed 4000 miles for the trip and there are still only 200 to go before I fly back to Europe, with any luck the rest of the set up will make it even if the chain and gearing are looking a bit tired. Of course the new folding bike is being assembled as we speak so this is the last outing for the B’Twin for a while. Australian flat part of Victoria gave me several days of long riding but also, being late autumn, some soggy days. Camping is becoming more difficult in the late autumn, I had to glamp (get a campsite cabin) a night or two to combat the cold. Spent quite a bit of time with Adam and 4 nights on the yacht during the sailing course. Food is a bit more expensive in Australia but the variety is more, they even have better cheese. I have finished the protein supplement and I have to admit that I miss it, especially the convenience of it. I’m eating a bit more fruit but I’ve decided that when I get back to Europe I’ll start juicing to get my fresh fruit and veg intake higher. Australia is a big place, there are days when the only interesting thing is cycling. I have seen only one snake and no spiders, the cold is helping. I have decided that next trips will be without laptop, camera and GPS tracker. The mobile phone will do all of that. These 1000 miles were a bit in New Zealand and a bit in Australia. the end of New Zealand was good but Australia has proven offer more interest thanks to the change of scenery. I have to admit I am getting a bit tired and my old body is starting to feel the strain. I have been carrying a bit of an injury for a few days, the Achilles Heels got inflamed but they are getting better now. Melbourne was good fan and being taught how to play Aussie Rule Football was interesting. 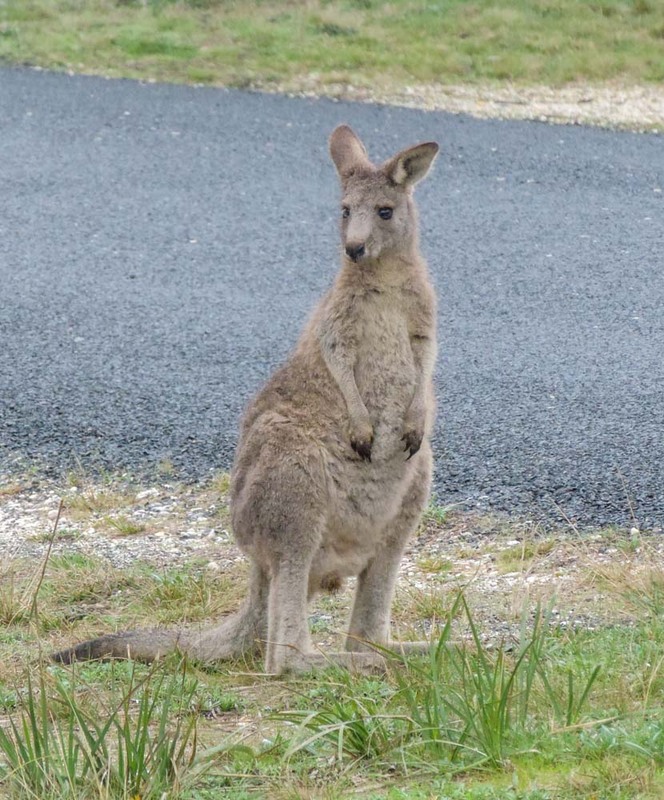 I like kangaroos and by now they have become less of a novelty. All in all I’m pleased I came to Australia.